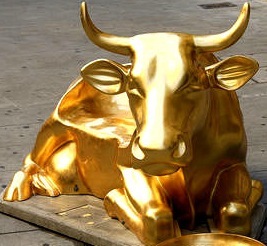 Whenever I read the story about the golden calf in the book of Exodus, my mind immediately goes to a scene in the movie, Ten Commandments, where Moses played by Charlton Heston is on the mountaintop talking to God and the people have convinced Aaron to make them a golden calf. In this scene, the golden calf is paraded around the camp, while “exotic” looking women are flinging their bodies across it and jewelry and treasure are being tossed at the statue’s feet. There is lots of cheering, music, dancing, and an appearance of reckless extravagance and eroticism. However, I feel that this image is misleading. The NRSV translates verse 8 using the plural form of elohim (gods), which can be either singular or plural in meaning. There is scholarly thought that in this context where Aaron made one golden calf and where in verse 5 he announces “a festival to the Lord,” the term is singular. Therefore, it would be more accurate to translate verse 8 as “He said, ‘This is your god, O Israel, who brought you up out of the land of Egypt. '” So with this translation, what was Aaron’s sin? Usually, Aaron is accused of making a false image of a false god, but is that where Aaron really went wrong? Maybe Aaron’s mistake wasn’t making a false god, but a false image of the true god. After all, while Moses was on the mountaintop, the people were getting restless and needed a tangible image of god to cling to in their hour of weakness. So, Aaron creates a false image of the true God. This story often gives us time to reflect on our own idols – things that we worship in place of God, such as wealth, fame, power, prestige, material things, or even people. But how about those things that we associate with God – things that are about God and have much to do with God, yet we end up worshipping them instead of God? Hence becoming a false image of the true God. Things like the church building, the old liturgy, the retired pastor, or a doctrine we cling to too tightly. The funny thing is you never know what things are idols until it is moved, removed, slightly altered, or merely suggested that it is outdated. At a church that I interned, there was a huge picture of Jesus hanging in the hallway. It didn’t bother me that the Jesus was a white man as much as this painted Jesus had an odd resemblance to the late Jerry Garcia and a happy, jolly version of him at that. Every time I walked down to coffee hour after worship, there was Jerry “Jesus” Garcia waving at me. When I inquired about it, a member of the church said that this was painted by a long time member and had been hanging in this hallway for years. When I first started at St. John’s, John, my Head of Staff, was putting some old wooden, worn out, and ornate chairs on the sidewalk, hoping that someone would find them useful and attractive for their own home. Things in San Francisco have a funny way of disappearing off the sidewalk. If you don’t want something put it out and someone is bound to take it off your hands. When I asked him what he was doing, he informed me that the person who donated these chairs was no longer living so he felt it was okay to finally get rid of the chairs. Now to be fair, St. John’s is an old church, over 100 years old and you would be surprised about the stuff we find. However, this begs the question, do we have to wait for someone to die or certain people to leave for appropriate change to happen? Fourth meeting – Topic: How is/can St. John’s worship be relevant to the needs of our faith community as well as the community around us? During our time together, I took copious notes – mostly listening to the conversation and writing down words that would often come up when describing worship. Interestingly, the words used were a combination of polar opposites. These are what we at St. John’s value in worship. These words are the guidelines we are to use when we make changes to our worship. What this says to me is that the changes made need to find balance and harmony between what can appear to be opposites. The wonderful challenge is making the changes reflect both/and and not either/or, meaning whatever changes need to be made need to be both meaningful and playful, not just meaningful or just playful. Because St. John’s is a diverse community, we need to make sure that there are entry points into worship for the young and old, those that need reflection as well as interaction, and visitors that seek to feel comfortable and members that desire to be challenged. The danger is to not fall into the trap of needing to please everyone and therefore pleasing no one as well as having a worship with too many unconnected elements or liturgy that is watered down. What I like about these guidelines is that it gives a foundation and a framework to keep changing, evaluating, and adapting. So, if people in the congregation are upset about taking out the doxology, it is important to know why they value the doxology. If it is for traditional, meaningful, respectful, and comfortable values, then is there something else that can replace it that holds those same values yet also allows for other values? 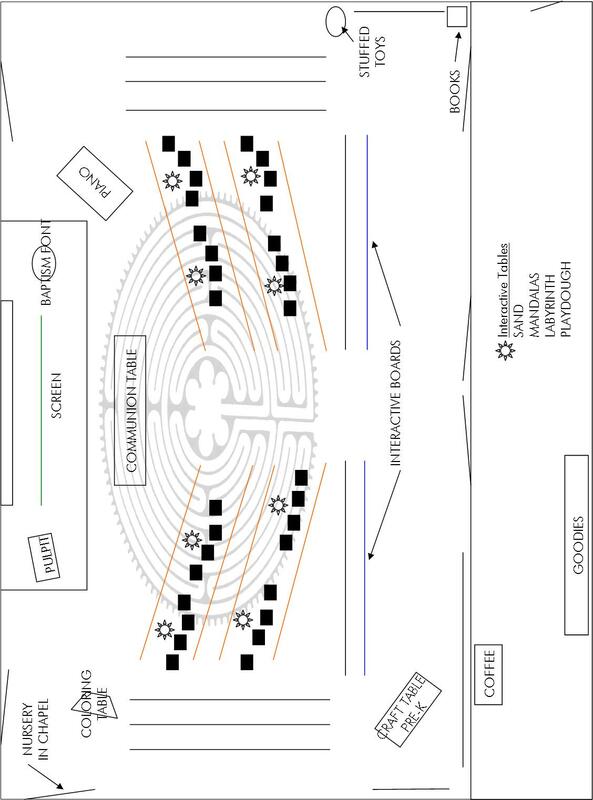 Some ideas that we are looking to implement is using our sanctuary space for yoga classes and musical concerts, and creating a labyrinth to be used in a taize type service. Communal space is a hot commodity in San Francisco. To be able to allow the community to use our space is a wonderful service and outreach that we can easily provide. These ideas may not be innovative or new, but that isn’t the point. The point is to adapt change that is appropriate and relevant to the values of the community. Now, within the worship space for St. John’s, we are playing around with a configuration that would meet the above guidelines. Some of these changes have already taken place and some we are working on, which I already shared. The below diagram gives you a mock-up of some of the changes. It isn’t to scale, but at least gives you an idea of the concept. 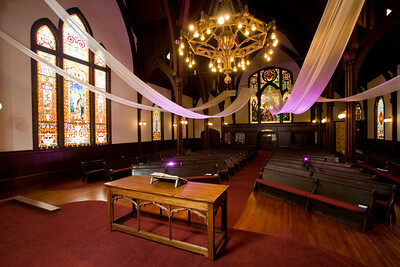 This is a picture of our sanctuary. It’s beautiful and traditional. This is a top-down view of the sanctuary and the narthex. The straight lines are the pews. The black straight lines are pews that will remain stationary. The orange straight lines are pews that will be able to be moved using a dolley system. Chairs will be used in the midst of the pews so that we can create some areas where interactive tables are. Some ideas for the interactive tables are drawing in sand, finger labryinth, playdough, and coloring mandalas (circular patterns). This is to give people an option to interact in a quiet and reflective way during worship whether it is prayers, sermon, or offering. It is also very intergenerational for families that want to sit together. 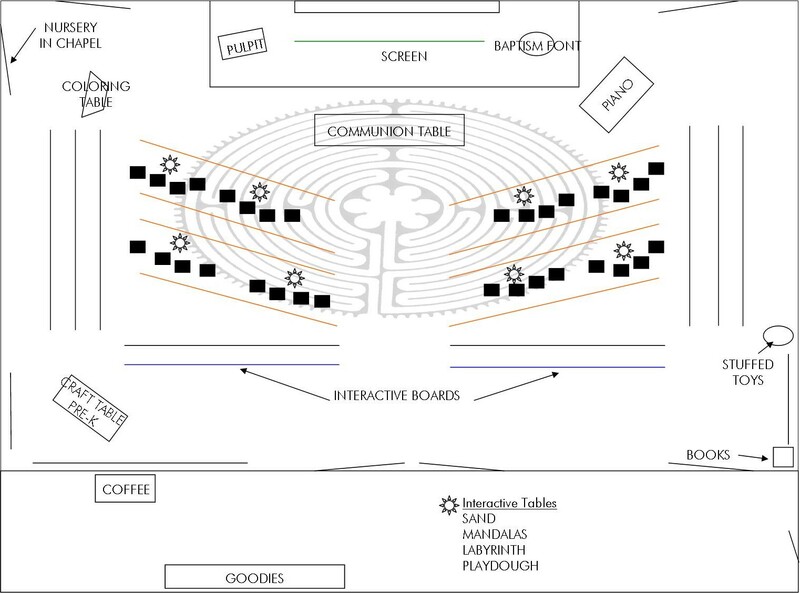 The blue straight lines are pews that will have an interactive, tactile board adhered to the back of them. We have many babies and toddlers that roam in the back of the sanctuary and this would give them a way to interact in worship. I will post a blog about how to make these later. For our small congregation, the pew and seating arrangement provides an intimate, comfortable, and approachable worship atmosphere. Currently we preach, pray, and lead in front of the communion table which makes worship informal in such a beautiful, formal space. We hope to be more “green” in the future, which may mean the use of a screen and projector instead of paper bulletins. These are some of the immediate changes that we have come up with and a lot of them focus on logistics rather than the liturgy itself, but change takes time. I look forward to seeing other ideas that will generate from the guidelines and framework our worship team have set. Soooo, what you have written seems to me to be the very strong beginnings of a worship grant thru Calvin Institute for Christian Worship. What you speak of is worship renewal and I think you could get money for this!! I say go for it! I love what you are doing! How would you (or anyone else) respond to the congregation’s reaction that “the kids will be noisy”? So far “that’s just a part of kids” hasn’t been sufficient. You are right. It’s more than that kids are noisy. I posted our kids guide to worship that addresses this, but it is about creating a permissive atmosphere so all feel comfortable to worship as they are. An example of this was when one of our worshippers who has dementia started to shout while I was preaching. Because we were used to the noises of our kids, no one stared at her or rushed her out. She was allowed to worship in the state she was in.